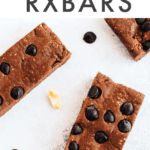 Peanut butter chocolate protein bars created in honor of my beloved RXBAR. They pack the same amount of flavor and they’re so easy to make. Yes! In case you aren’t aware, I’m both a personal trainer and a health coach. Lucky for me, I’ve learned from both of these specialties about the importance of fueling up after workouts. 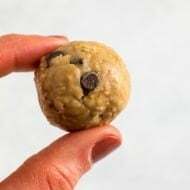 I try to get a mix of protein and carbohydrates in my body within an hour of working out — protein to help rebuild my muscles and carbohydrates to help rebuild my energy stores. 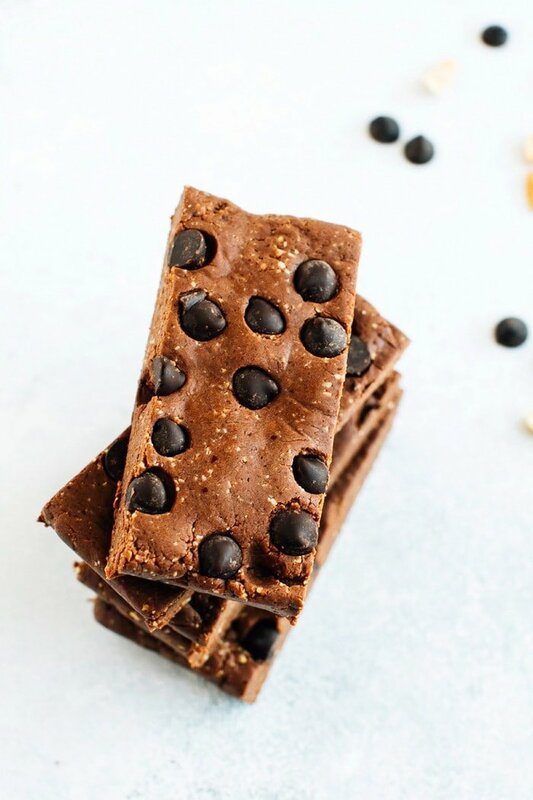 I go through phases of grabbing certain snacks to keep in my gym bag — sometimes it’s protein powder to simply shake up with water, other times it’s been protein bars or energy bites. I went through a phase when I was constantly packing RXBARs for a post-workout snack. I would buy them by the case because they were (and still are!) that good. I love the ingredient list, and they were actually a satisfying snack for me — especially after a workout. I quickly realized how much money I was spending on RXBARs and I figured I should probably rein it in. 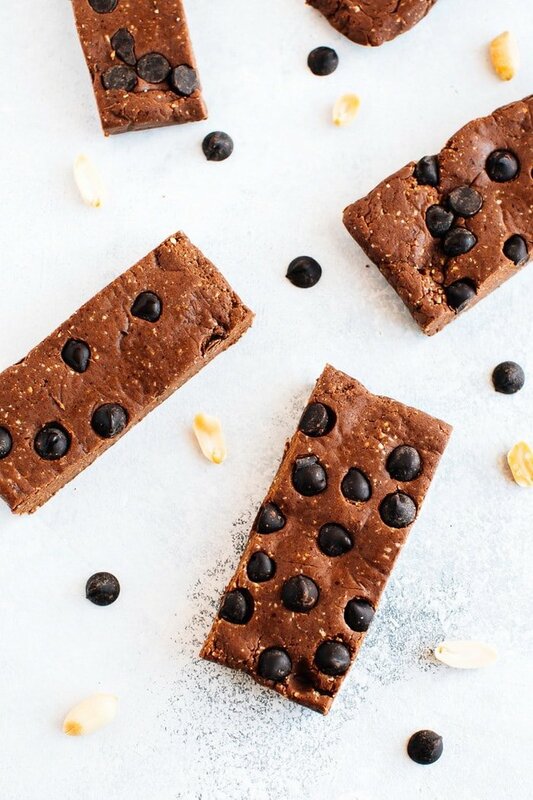 These copycat protein bars are a product of that realization, and you guys… they’re amazing. 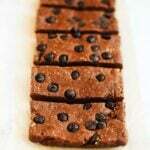 Treat yourself to a protein bar for a fraction of the price! I can’t wait to experiment with more flavors. Maple sea salt, I’m looking at you! High in protein! 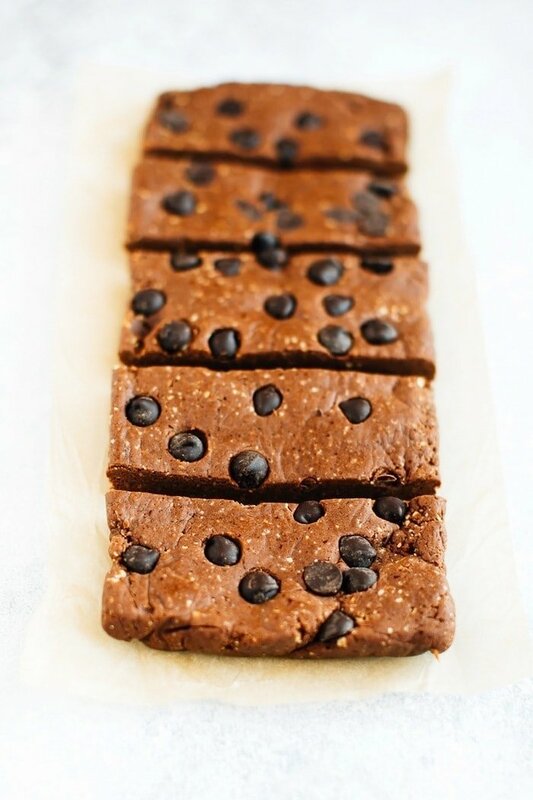 The protein powder and peanuts pack a solid protein punch in these bars. E-A-S-Y. Seriously, I can throw these together in 15 minutes or less! Gluten-free and paleo-friendly, with a vegan option. Technically these are bars, but if you’re a ball gal or guy, you can absolutely roll them into balls! 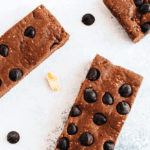 I can’t wait to hear if you take on the challenge of creating your own protein bars. I promise it’s worth it! 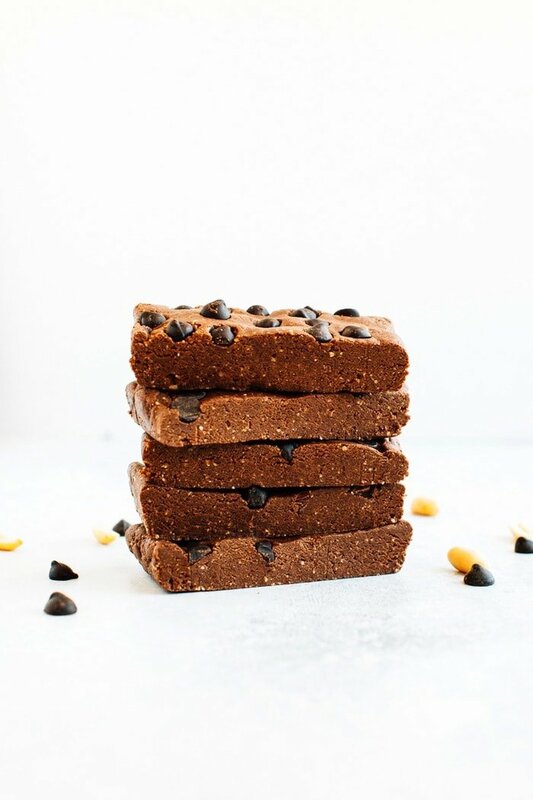 Homemade peanut butter chocolate protein bars created in honor of my beloved RXBAR. They pack the same amount of flavor and they’re so easy to make. Yes! At this point the mixture might be sticking together well and forming a ball of dough. If so, great! If not, it may be dry and not really sticking together (it will depend on how moist your dates were). If this is the case you’ll want to add a little water. Add 1 Tablespoon, run the food processor and see if the mixture starts holding together. If not, add another tablespoon and blend again. You’ll likely only need to add 1-3 Tablespoons of water. Once the mixture is holding together, transfer into the loaf pan lined with parchment. Fold the parchment over top and press the mixture evenly into the pan. Once even, add chocolate chunks and press those into the top of the mixture as well. 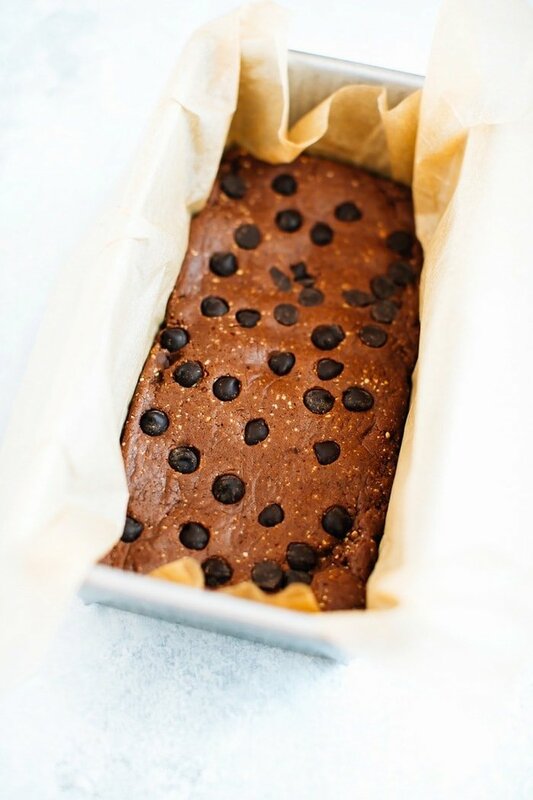 Place the mixture in the fridge to harden up (about 30 mins to 1 hour) before removing from pan and cutting into 5 bars. Store bars in fridge for up to 1 week. Enjoy cold or at room temperature. What do you usually eat post-workout? I want to hear your routines! 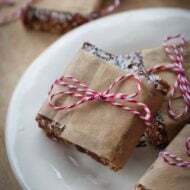 Be sure to let me know if you try these peanut butter chocolate protein bars by rating the recipe, leaving a comment and/or posting a photo on social media. Just don’t forget to tag @eatingbirdfood or #eatingbirdfood so that I see your post! 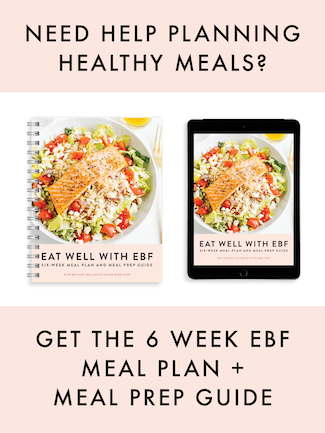 I’ve been on the collagen train lately (I’m not sure if I’m noticing a difference yet, but, like you said, it can’t hurt and it gives me a protein boost so why not), so I was about to comment and ask if collagen powder would work in this recipe when I saw that you had already addressed my question. 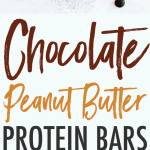 Like you, I’ve been trying to make more of my own snacks and bars for pre- and post-workout and these look fantastic. I can’t wait to try them! 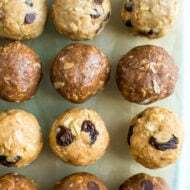 Yes, one thing to note with using collagen protein powder is to make sure your dates are fresh and not dry because it’s better if you don’t need to add water. If you do add water, the mixture gets super duper sticky. By “cocoa powder” I’m assuming you mean a powder that is just cocoa with no added sugars, correct? Like Navitas? I love RX Bars and have always wanted to try making my own. These sound delicious. Happy Birthday! Could you sub powdered peanut butter in place of the peanuts ? Thanks! Happy birthday! 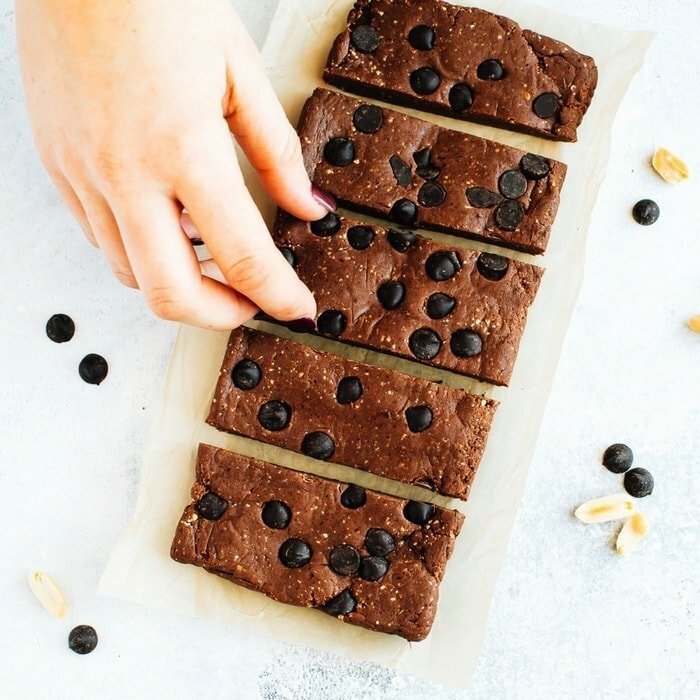 I have made at home versions of the Chocolate Coconut and the Blueberry RX Bars before but not this variety, looks great! Hello from Romania! I love your recipes!❤ Can i use oats instead of protein powder? Can these bars go without refrigeration for traveling, taking on an airplane? I like these MORE then the expensive ones I buy….will be making over and over.